Welcome to Hiring for Hope (HFH), the new home of JobAngels, a grassroots movement, and employment networking program dedicated to bringing people together in a virtual community where each person commits to a single goal: to help just one other person find gainful employment. 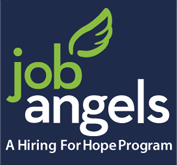 ** To learn more about Hiring for Hope and all of our services visit our special JobAngels Welcome Toolkit. Create and provide HOPE to others by helping us to spread the word about our JobAngels program. Just copy and paste the code in the right window to display the graphic on the left. Copyright � Hiring for Hope. All Rights Reserved.